Insurers voiced strong support for different standards and argued that the Fed has sufficient authority under the Collins amendment to do so. Sen. Susan Collins, R-Maine, today unequivocally supported the insurance industry’s contention that the Federal Reserve Board was wrong in seeking to impose “bank-centric” rules on insurers subject to Fed regulation. She testified before a Senate committee that her amendment to the Dodd-Frank Act dealing with minimum capital standards for bank and thrift holding companies regulated by the Fed does not require the Fed to supplant prudential state-based insurance regulation with a bank-centric capital regime for insurance activities. Insurers which operate savings and loans and come under Fed supervision as their consolidated regulator. She said that her amendment “allows the federal regulators to take into account the distinctions between banking and insurance, and the implications of those distinctions for capital adequacy,” a point with which the Fed, especially its lawyers, disagree. 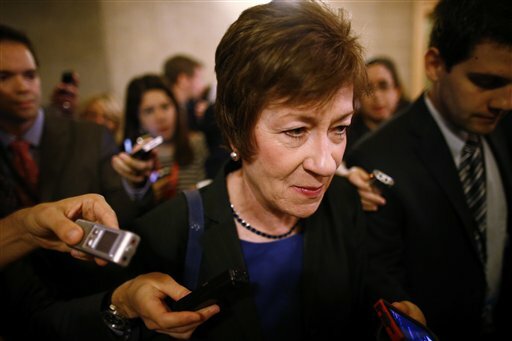 “While it is essential that insurers subject to Fed oversight be adequately capitalized on a consolidated basis, it would be improper, and not in keeping with Congress’s intent, for federal regulators to supplant prudential state-based insurance regulation with a bank-centric capital regime for insurance activities,” Collins said. And, to emphasize her point, she disclosed that she had introduced legislation Monday in the Senate, S. 2102, which would exempt insurers regulated from the Fed from those requirements as long as the insurers are engaged in activities regulated as insurance at the state level. Collins made her comments in testimony before two subcommittees of the Senate Banking Committee: The Financial Institutions and Consumer Protection and Securities, Insurance and Investment Subcommittees. “My legislation also provides a mechanism for the Fed, acting in consultation with the appropriate state insurance authority, to provide similar treatment for foreign insurance entities within a U.S. holding company where that entity does not itself do business in the U. S.,” she said. Insurance companies testifying at the hearing voiced strong support for different standards, and argued that the Fed has sufficient authority under the Collins amendment, Sec. 171, to do so. Those testifying in support of a different standard than that imposed on banks included officials of TIAA-CREF, Nationwide Mutual Insurance Co., a lawyer representing MetLife, and the director of the Financial Regulatory Reform Initiative, Bipartisan Policy Center. TIAA-CREF and Nationwide, as well as State Farm, operate large thrifts overseen by the Fed. MetLife is in the last stage of evaluation by the Financial Stability Oversight Council as a potential SIFI. But, a note of caution was invoked by Sheila Bair, former chairman of the Federal Deposit Insurance Corp. She agreed that the Fed “can and should” craft a capital framework appropriate to insurance products, and should have the discretion to defer to state insurance regulators in establishing capital standards for the insurance activities which they regulate. She said S. 1369 and S. 2102, which does the same thing, “would provide a wholesale carve-out from common sense protections” contained in Sec. 171. This would give insurance giants “a significant competitive advantage over banking organizations engaged in the same activities, and leave the door open to the kinds of highly leveraged risk-taking which contributed to the 2008 crisis. “We should not forget that in 2008 AIG was also an insurance company, which took excessive risks in its nonstate regulated affiliates,” Bair said. Daniel Schwarcz, an assistant professor and research fellow at the University of Minnesota Law School, agreed. “Unlike state risk-based capital rules, which focus primarily on consumer protection, these federal capital standards should focus on the distinctive ways in which Insurance SIFIs can pose systemic risk to the larger financial system,” Schwarcz said. He said this approach is “perfectly consistent” with the Collins amendment. “I will caution against” exempting bank/thrift holding companies from Sec. 171 simply because they or a large number of their subsidiaries are subject to state insurance capital requirements, Schwarcz said. He said that could encourage them to increase their insurance business, encourage them to create an uneven playing field among different types of bank holding companies and savings-and-loans holding companies. Insurance industry officials who testified voiced strong support for a carve-out from bank centric rules, although they implicitly acknowledged the authority of the federal government to have some role in overseeing insurance companies. “Applying metrics designed for banks to an insurer would be inappropriate and could have a number of negative effects for insurers, customers, and the economy as a whole,” said Gina Wilson, executive vice president and chief financial officer of TIAA-CREF. She said TIAA-CREF is “particularly concerned about the effects of the rule on our ability to continue providing our clients with a full menu of appropriate and reasonably priced financial services products. “The Fed can use the flexibility permitted by the DFA to tailor capital standards for the insurers that they oversee, which is key to resolving most of the potential negative repercussions that may result from imposing a bank-focused capital regime on insurance companies,” Wilson testified. H. Rodgin Cohen, senior chairman of Sullivan & Cromwell LLP, testifying on behalf of MetLife and other insurers, testified that, “it is seemingly inconceivable” that Congress, or any regulator, could conclude that the same capital requirements should logically or appropriately apply to all financial services companies that are deemed systemically important. He said that various types of financial services companies have different business purposes and asset and liability structures, and they are exposed to different types of risk. “The application of a bank capital framework to insurance companies would be inappropriate, redundant and punitive, not only because it is a second capital regime (in addition to the risk-based capital framework), but because the bank capital framework was not designed to, and does not, take into account the critically significant differences between the business of banking and the business of insurance,” Cohen said. In strong comments, Cohen added that, “What is most striking about this question is that I do not know of a single legislator or regulator, including the Fed, who believes that, as a matter of policy,” a bank capital framework should be automatically imposed on insurance companies. “Nor do I know of a single member of Congress who maintains that Congress actually intended to impose the identical capital regime on these two very different businesses,” Cohen said. He added in his testimony that, a more optimal regulatory approach should include a federal insurance regulator and optional federal charter. “The benefits of such a regulator grow if the Federal Reserve is unable to adjust its bank-centric approach to insurance companies,” Klein said.